We know your business keeps you busy and the last thing you have time for is worrying about dirty, scuffed or damaged walls in high-traffic areas, offices, and common areas such as lobbies, hallways, and break rooms. Best of all, we offer flexible after-hours scheduling and with our eco-friendly, low-odor, quick-dry paints, you’ll hardly notice we were there! The outside of your home or business offers your visitors that all important first impression. 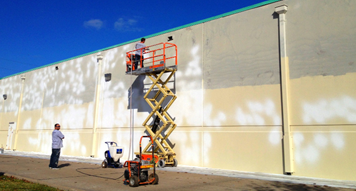 At the time of your proposal, your Particular Painting project manager will note any additiona preparation that is needed. He or she will also ask about the colors you want to use. If you’re undecided, we can help you choose or we can contact a professional color expert to help you pick just the right shades.